Sam Burgess: A scapegoat, a quitter, both - or neither? Well, that didn't quite go as planned. In fact, Sam Burgess's switch from rugby league to union might be the messiest conversion since Henry VIII. A year after joining Bath from Australian rugby league outfit South Sydney Rabbitohs amid ear-splitting fanfare, Burgess is heading back again. Cast by some as one of the key reasons for England's dismal World Cup failure and by others as a scapegoat, what is certain is that a wonderful opportunity has been wasted. None of England's coaching staff will have their heads chopped off as a result of the ill-fated Burgess experiment, but you could argue they lost them months ago. Jonathan Davies, a more successful cross-code international from another era, just about sums it up when he calls the whole episode "a bit weird". "I feel sorry for Sam being put in this situation by England," says the former Wales and Great Britain legend, who went the other way from union to league in 1989, before returning six years later. "The England coaches didn't seem to have a plan for him. It's technically so hard to go from league to union. Not only that, he was playing one position for his club and another for his country, and trying to learn two positions made things twice as hard for him. It was madness, really. "He just wasn't ready. But it was the coaches' job to decide whether he was ready or not. It's all turned out to be a bit of a disaster but it's not Sam's fault." Indeed, the reaction to the news that Burgess has broken a £500,000-a-year contract with Bath - the Premiership side thought they had secured his services until at least June 2017 - has been mostly sympathetic. "No player on the planet could make the transition from rugby league to union in such a short space of time," says former England scrum-half and BBC pundit Matt Dawson. "I find it incredible that the England coaching staff thought he could be a leader in a decision-making role. And I feel desperately sorry for Sam, that someone deluded him into believing he could do it. "If I was in his position, with the choice of being a superstar rugby league player, playing a game I love and understand completely, or playing union and having every single mistake scrutinised, I know what I'd do." Henry Paul, another cross-code convert who won six union caps for England in the 2000s, thought Burgess would ride out the storm but also understands why he is heading back down under. "Sam had a lot more to show in rugby union, so I'm a little bit surprised he's gone back already," says Paul. "What Sam has done might seem a bit selfish and he will be criticised for it. But he's given a lot to Bath in the short time he's been there, helping them get to the Premiership final, and played for England in a World Cup. If he's not happy, I don't think he'll really care what anyone else thinks." Burgess isn't the first rugby league superstar who failed to live up to the hype in union and he won't be the last. Iestyn Harris was magnificent for Leeds Rhinos but blew hot and cold for Wales in the early 2000s. Benji Marshall was magnificent for Wests Tigers and New Zealand but lasted two months in union last year, admitting to being baffled by the 15-man game. Paul was one of rugby league's most thrilling talents for Wigan, Bradford and New Zealand before being lured to Gloucester in 2001. A few months later, he made his debut for Clive Woodward's England. "I probably got picked too soon and didn't do myself justice," says Paul, who was thinking about heading back to rugby league almost as soon as he pitched up at Kingsholm. "But you're not going to say no. There's a lot of pride involved and all you can do is tell the coaches you're going to do your best. "It was only after about 18 months in union that things started to click. I was voted one of the best three Premiership players of the season in 2003 and when I was picked again by England, I thought I deserved it." Paul earned five more England caps under Andy Robinson in 2004 but suffered the ignominy of being substituted after only 26 minutes in his final match against Australia, after which his union career petered out. One of the greatest mysteries of the Burgess situation is that England defence coach Andy Farrell knew exactly how mystifying union can seem to a former league player, however talented. Farrell was another league great, but union didn't really know what to do with him when he converted in 2005. His club side, Saracens, wanted to play Farrell at flanker, England at centre. Ring any bells? Yep, that's because Bath wanted to play Burgess at flanker, England at centre. Having bought out Burgess's contract with the Rabbitohs without any financial help from the Rugby Football Union (Premiership rivals balked at the idea of the RFU helping to bolster Bath's squad), Bath were entitled to play Burgess where they saw fit. And, actually, Burgess was doing just fine in the back-row. It was England's midfield dilemma - umpteen combinations were tried and discarded by head coach Stuart Lancaster - that propelled Burgess into England's World Cup plans as a centre. Even then, Lancaster had the luxury of omitting Luther Burrell, who went from first-choice inside-centre to yesterday's man in the blink of an eye, and Burgess's Bath team-mate Kyle Eastmond, who was in terrific form at the end of last season. 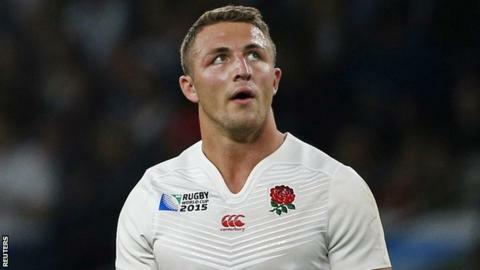 Dawson and former England captain and centre Will Carling were just two wise heads who suggested Burgess wasn't ready. Even the 26-year-old Burgess suspected as much. "I caught up with Sam before the World Cup warm-up game against Ireland and he admitted it was completely different to league," says Paul Sculthorpe, another former league legend and a friend of Burgess. "He was the first to admit he was still learning the game." Meanwhile, Sonny Bill Williams, arguably the All Blacks' most successful league convert, insisted Burgess should have been on the side of the scrum rather than out in the backs. The comparison with Williams is most instructive. Williams had been playing union for 28 months before he was called up by the All Blacks in 2010, learning his craft alongside vastly experienced internationals such as Jonny Wilkinson and Tana Umaga at Toulon. But even with such fine teachers, Williams had doubts about his abilities. "The first year in France I was pretty much busted," Williams told BBC Sport in 2013. "I didn't think I could play rugby union. But at the end of that first season I made up my mind I was going to give it a crack." Even after Williams broke into the All Blacks set-up, he had to stay humble. As is often said of Burgess, Williams had "an aura", but all those accolades he'd amassed in league counted for little in the 15-man game. As such, Williams has never been a regular starter in big matches, instead being used as an impact player, causing havoc off the bench. Had Burgess been deployed in a similar way - as he was against Ireland in the final World Cup warm-up game and to good effect against Fiji in England's World Cup opener - the chances are he would have walked away from the ensuing car crash almost unscathed. But it was an injury to Jonathan Joseph and Lancaster's fateful decision to start Burgess in midfield against Wales, alongside Owen Farrell and Brad Barritt, that led to Burgess being caught up in the wreckage. Some of the criticism - much of it from ex-players - was savage. Former Ireland centre Gordon D'Arcy wrote that Burgess's "naivety embarrassed those around him and severely damaged England's chances of reaching the quarter-finals". Others were more charitable, pointing out that England were winning when Burgess was substituted. "Given the short amount of time Sam had been in union, standing toe to toe with [Wales centre] Jamie Roberts like he did was phenomenal," says Paul. "But England just didn't get the balance right in midfield. They had a system in place and all of a sudden they started chopping and changing during a World Cup. That's what killed them. But that's not Sam's fault." Burgess was dropped to the bench for the must-win pool game against Australia, before being left out of the match-day squad for the dead rubber against Uruguay - a rough way to handle a valuable and vulnerable asset. "Sam was an easy target, especially for rugby union people who didn't want him in the team in the first place," says Sculthorpe. "But if somebody asked you to play for England in a World Cup, of course you would. That's not arrogance, he just knows what a top player he is. I'm good friends with Andy Farrell as well, but the buck stops with the coaches who picked him." Sadly, Burgess's treatment in union made his decision to return to league a lot easier than it should have been. True, Burgess is adored by fans of the Rabbitohs, whom he helped win the NRL Championship in 2014; he has two brothers in the Rabbitohs squad, another at Manly; his mum has relocated to Sydney and he has an Australian fiancee; Christmas will be sunnier down there. Furthermore, while three-quarters in union are sometimes peripheral figures, in a league game Burgess might make 40 tackles and 40 carries. As Sculthorpe says: "You only get one career and he'll want to enjoy his rugby." But if Burgess had been handled with more care, his union career might have blossomed into something beautiful. He might have been another Sonny Bill Williams. He might even have been adored at Twickenham. Instead, he'll be remembered by many as another league convert who found union a bit of a mystery and quit. Unfair? That's divorce for you. Listen to the 5 live podcast on Burgess' departure.